PREFACE: Whaling is largely a historic human behavior. It’s part of the local and cultural heritage of many human populations across the planet. My own family has deep roots in Nantucket Island, home to thousands of whalers plying the world oceans in search of the fortunes of oil during the 18th and 19th centuries. But here’s the twist, my cultural heritage does not have to define my culture today. My great-grandfather, Frederic Wilbur Manning, Minister of the First Congregational Church on Nantucket between 1902 and 1911, wasn’t able to access Google when he was researching his Sunday sermon. He couldn’t go down to the 5 and 10 and pick up some fresh tomatoes and Parmesan cheese any day of the year for his seven children’s suppers. And it would have taken him the better part of 4 months sailing the Clipper Route to arrive in New Zealand (whereas I can get there in about 12 hours!). Things most certainly have changed over the past 100 years - including our cultures. In my opinion, our cultures must change as the world around us changes. (Imagine what the world would be like if human cultures didn’t change!) What’s truly novel about the world we live in today is that it is changing so quickly - perhaps too quickly for culture to keep pace? I reckon that cultural changes, such as starting or stopping whaling, are a natural occurrence in the evolution of the human position in a dynamic Earth system. It is what it is, and it most certainly ain't what it was. 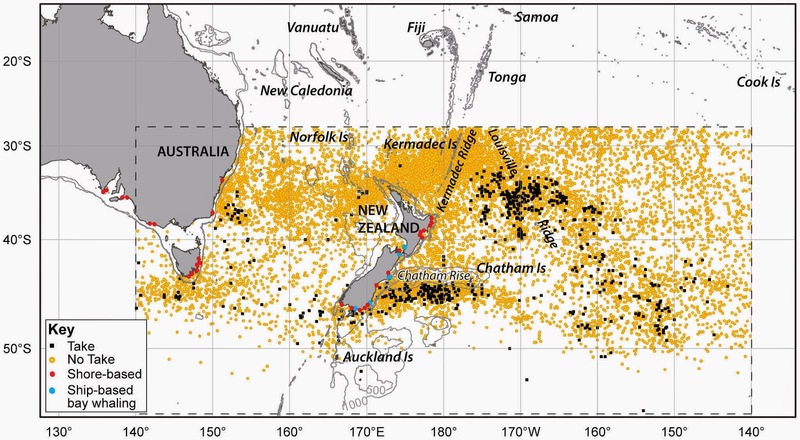 Observations and 'takes' of Southern Right Whales by American whalers. Approximately 50,000 Southern Right Whales were taken by American whalers from the region shown between 1830 and 1850. Figure and information from Carroll et al, PLoS-ONE, 2014. Humans have killed whales for thousands of years. Whaling is part of the subsistence cultures of many indigenous/first-nations peoples around the world. Most of these cultures used whales as a means of survival, by using the whale tissues as both a source of meat and oil, in addition to using whale bones/baleen for fashioning tools, works of art and other forms of cultural expression. Yet, archaeological and anthropologic evidence clearly shows that most indigenous cultures, whether they hunted whales or not, revered and respected whales. Kohola (i.e. whales) are deified ancestors to native Hawaiians. More than 7000 kilometers to the southwest, Maori not only had a word for whale (Tohora) but also six different names for six different species of whale that frequent the waters around Aotearoa/New Zealand (southern right whale = raiti wera; hakura or iheihe = Gray’s beaked whale; paikea = humpback whale; pakake = minke whale; paraoa = sperm whale; upokohue = pilot whale). Maori had developed a taxonomical classification of whales to the species level centuries before western scientists! Indigenous peoples practicing subsistence living are not to blame for the plight of many of the world’s whale populations. That albatross is worn instead by many of the world’s most advanced human populations. Due to the demand for whale oil (for lamps), whaling during the 17th-early 20th centuries was largely driven by the rapidly developing world powers: the Americans, British, French, Germans, Norwegians, Russians, and Japanese. But the sustainability of whaling plummeted in the 1860’s and 1870’s with the technological advance of harpoon guns. It is perhaps no surprise that the most pressured whale fisheries were fished-out in less than 20 years (e.g. the Finnmark fishery of northern Norway at the turn of the 20th century). In recognition of the need to regulate whaling, many governments participated in the International Convention for the Regulation of Whaling. As of 2014, 88 governments are members of the convention’s legacy, the International Whaling Commission (IWC). Yet, despite creation of the IWC in 1946, whale populations continued to decline in many of the world’s oceans for several decades. It is now known that the Soviet Union, and likely others, grossly under-reported whale kills to the IWC for several decades (Ivashchenko, et al., Marine Fisheries Review, 2011; and references therein). 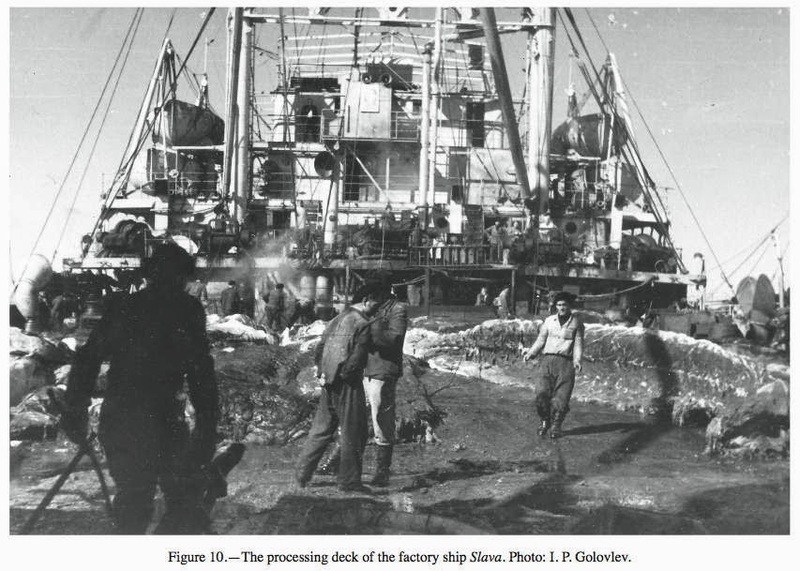 By ‘grossly under-reported’ I mean more than half of the ~340,000 whales killed by Soviet whalers during the middle 20th century were not reported to the IWC regulators. Unaware of the illegal whaling that had been going on behind their back for decades, the IWC decided (in 1982) to pause commercial whaling from 1986. This pause remains in effect today and many whale populations have started to show signs of recovery. But the IWC’s moratorium on whaling has not gone without its own controversies. The section of the Schedule to the International Convention for the Regulation of Whaling that lays out the moratorium on commercial whaling is known as paragraph “10e”. An interesting commentary by some of the most highly regarded whale experts in the world. From the outset, Norway and Russia, raised objections to paragraph 10e and thus are not bound by it (in accordance with IWC policy). 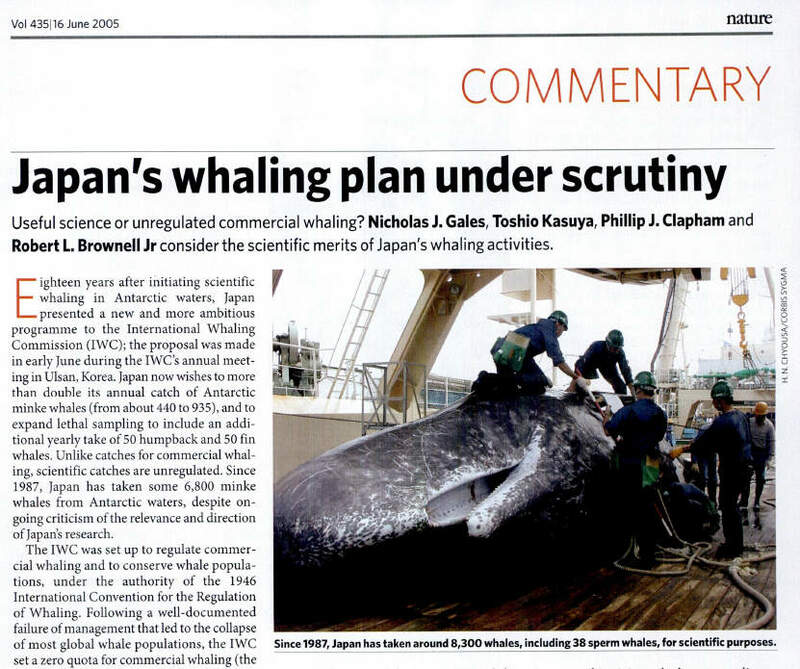 Yet, Japan did not raise an objection to paragraph 10e (presumably because the moratorium only applies to whales killed for commercial purposes and not whales killed for scientific purposes). And somewhere on the fence we find the government of Iceland, which has raised a reservation to paragraph 10e. Despite their reservation, Iceland is recorded in the schedule to the convention as agreeing that, “Under no circumstances will whaling for commercial purposes be authorised without a sound scientific basis and an effective management and enforcement scheme.” Eighteen countries, including the U.S.A., Australia and New Zealand, have lodged objections to Iceland’s reservation to 10e. There are many lessons to be learned from the history of whaling, and few of them are genuinely positive. The lesson that I would offer is this: respect your fellow mammal.